It’s dandelion season! Or it has been for a while now. For me it really isn’t fully spring until the grass is full of yellow dandelion blossoms and tiny white daisies. I love it so much that if I had a house and my own yard, I probably wouldn’t even mown the lawn, because flowers are just prettier. But when I say it’s dandelion season, I mean more that it’s dandelion eating season. You know when I was a kid I didn’t even like dandelion salad. My mom always loved it and she made it just as I do now, with potatoes and eggs, but back then that was something she made for herself and ate a whole bowl of, while I maybe only stole a potato or two, because that was the only thing that looked edible to me. Back then, what I preferred to do with dandelion was make hair crowns out of the blossoms and blow the puff-balls. The latter I still do today and with a lot of enjoyment. Walking by a dandelion puff-ball is impossible for me, I just have to get it. But, foraging dandelion greens is kind of a national sport here. Everyone does it, and why not make use of something that is free, but edible? If you drive through the country, you can sometimes see people slouching over on the green hills and that can only mean they’re picking dandelions. Clearly, I like dandelion greens now. I never pick them myself, because there are no good spots around my area, with too much traffic everywhere, I normally just buy some at the store. My grandmother lives in the nature and has always picked dandelions as a hobby, which usually means she ends up with more greens she actually needs, so I always get some. (Although this salad today is a result of a full bag that Rok’s mom gave us.) 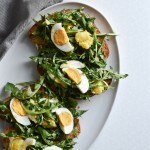 The thing with dandelion greens is that once you have them, they need to be used pretty quickly, so it only makes sense to share if you have too much. 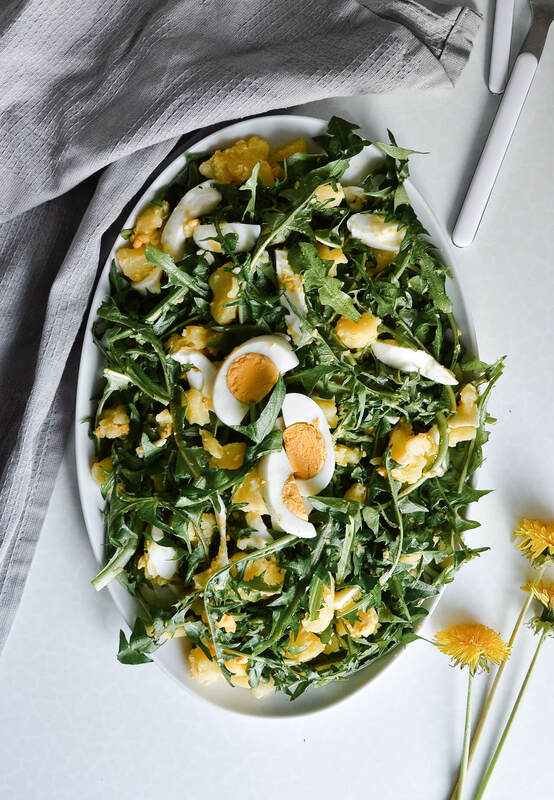 As mentioned before, this dandelion egg salad is made just like my mom used to make it for herself. It’s a pretty common way of eating dandelion greens and really delicious too. 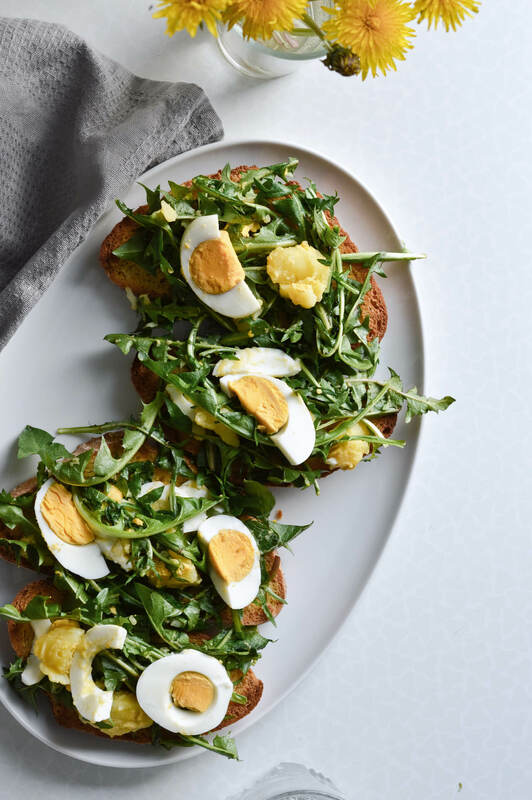 Dandelion greens have an earthy flavor and they’re chewy, so they need to be paired with something softer and more flavorful. The first thing are the hard-boiled eggs. 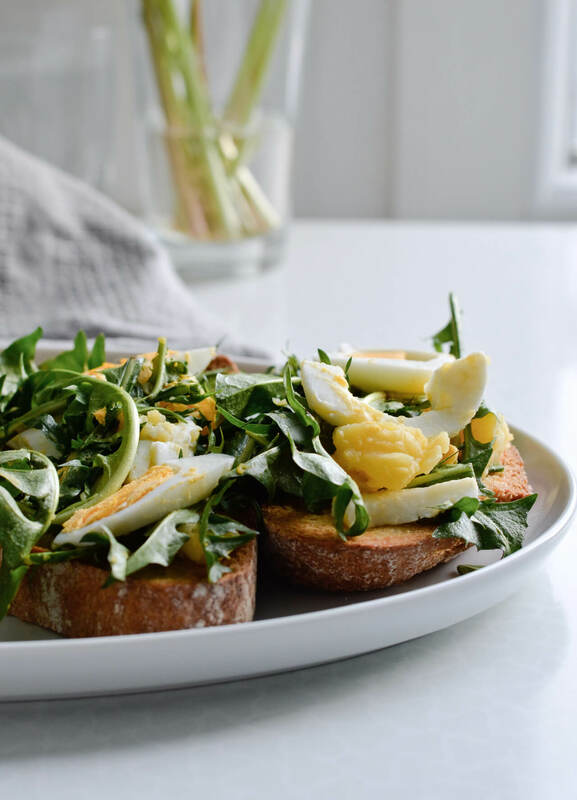 When sliced, the egg white, while soft, will stay intact, but the yolk spreads all over the greens and creates the creamiest, most flavorful coating. The other thing are cooked potatoes, which do the same thing. I like to cook the potatoes in their skins, because it gives them so much flavor. Then I peel and chop them, because the potatoes crush at the edges when mixed in the salad, which only adds to that creaminess of the yolk. All this salad needs on top of that is some olive oil, vinegar and salt. It’s very uncomplicated, but really good. 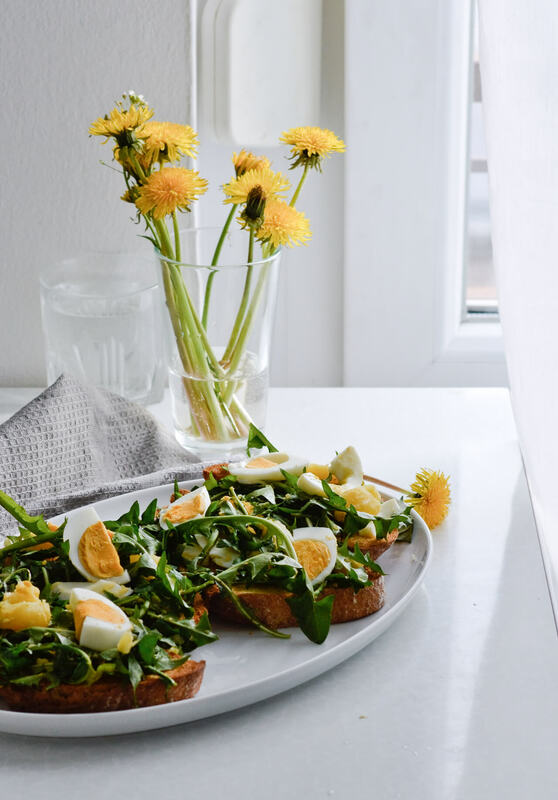 This dandelion egg salad can be a side dish or a full lunch, especially when paired with some bread. 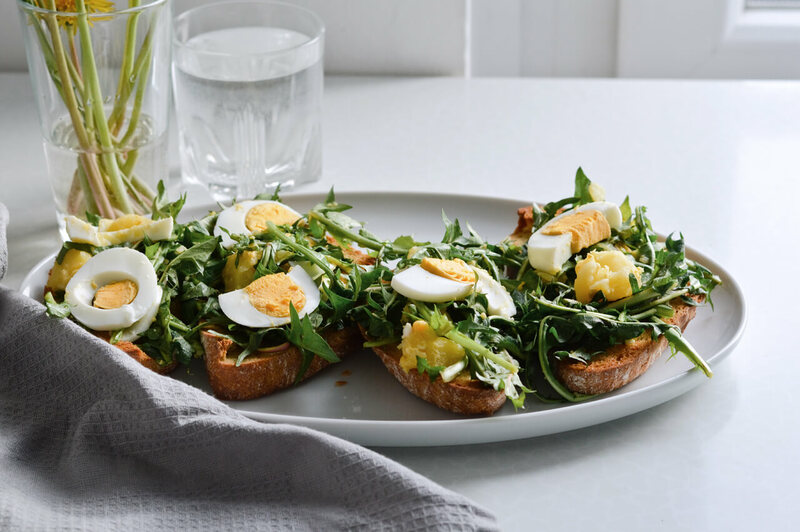 If the bread is toasted, the salad can also be served in the form of crostini. It’s different, but it works. Recipe easily serves 4 people. Place potatoes in a big saucepan and cover with cold water. Partially cover saucepan with lid and bring potatoes to a boil over high heat. Lower heat to medium-high and cook potatoes for about 30 minutes, maintaining a simmer, until they’re easily pierced with a thin knife or fork. Meanwhile, place eggs in another saucepan, cover completely with water and cover saucepan with lid. Bring to a boil over high heat, then remove from the stove and let sit, covered, for 10 minutes or until the potatoes are cooked. 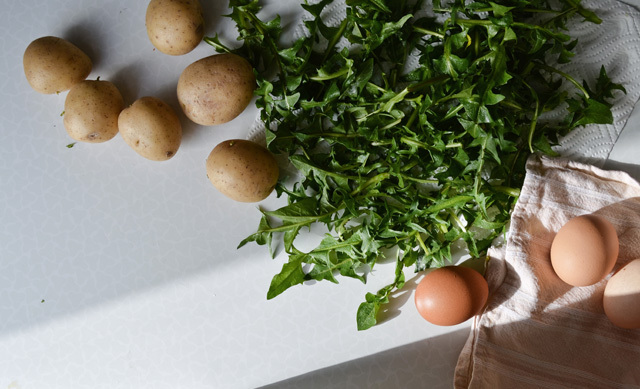 As the eggs and potatoes cook, rinse dandelion greens under water and dry with paper towels. In a small bowl stir together the oil, vinegar and salt; set aside. Rinse cooked potatoes under cold water. When cool enough to handle, peel the potatoes and slice into small bits. Peel all eggs, halve and thinly slice them. If using bread, this is when you should also toast the bread. 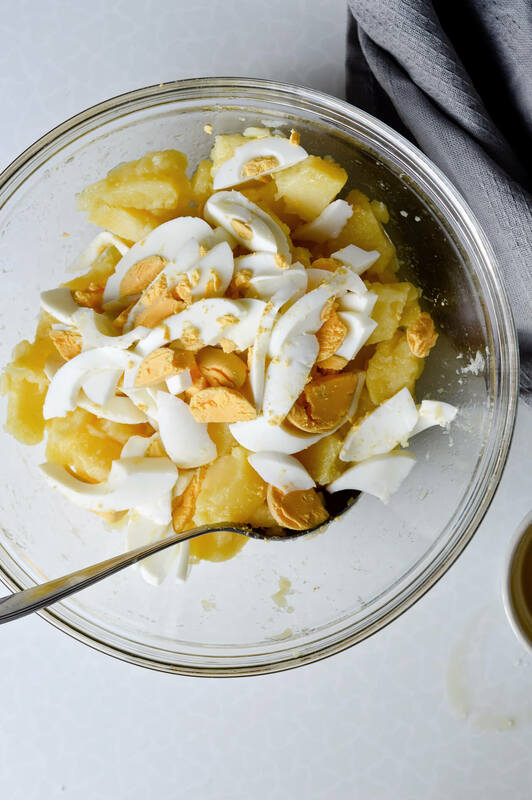 Combine the potatoes and 4 sliced eggs in a large mixing bowl, pour over 1/2 of the vinaigrette and stir until coated. Add the dandelion greens, the rest of vinaigrette and gently mix (with two forks or even your hands) until the potato mixture is evenly distributed all over the dandelion. 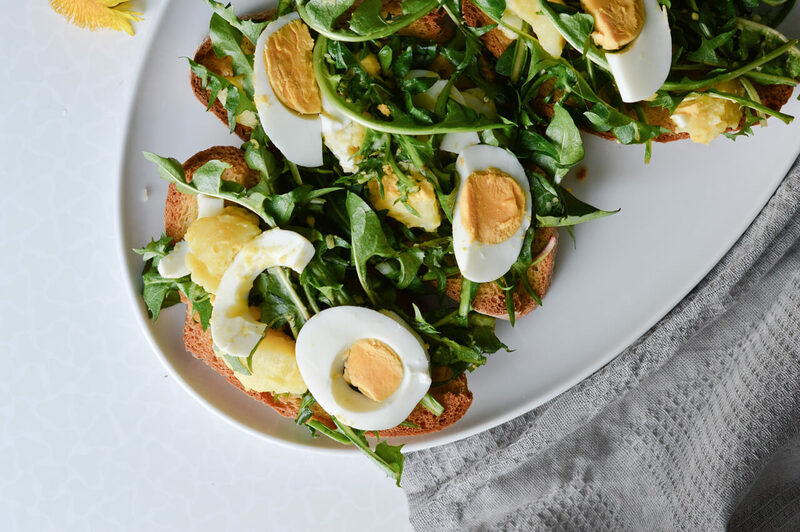 Transfer salad to a large serving plate, decorate with the egg you previously saved and serve with bread on the side. 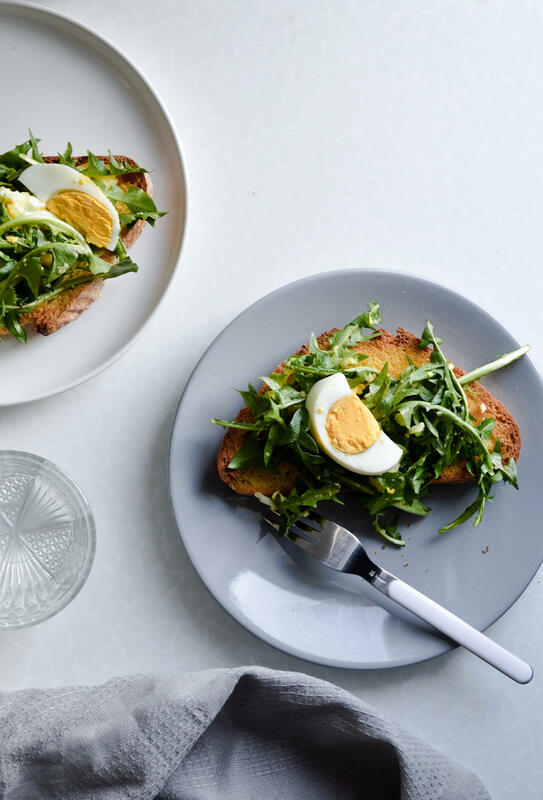 Alternately brush toasted bread with oil and add a portion of salad onto each slice. Eat immediately. You can always adjust the amount of ingredients used in a salad like this one. Some people prefer more / less potatoes or eggs. Personally I like a lot of both, almost a 50-50 ratio between the greens and the potatoes and eggs.